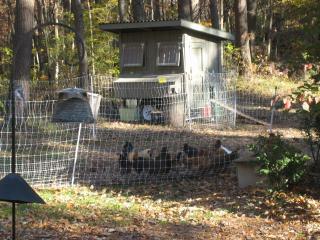 Twelve hens provide BuddhaBee eggs. They eat feed that is loaded with whole grains and also spend their days snacking on grass, leaves, and an occasional worm, caterpillar or bug. [FONT=tahoma,arial,helvetica,sans-serif]Since our supply of eggs is limited, please call to make sure eggs are available for purchase.